A few weeks ago I ran across a blog by Gary Hayes (brilliant!). He developed a “metaphorical chart representing the key fragmented lands of media”, and uses this to help communicate the need for transmedia storytelling. If you have time, go check out his blog (again, BRILLIANT!) Navigating the World of Multi-Platform & Transmedia Rituals | PERSONALIZE MEDIA. Alth0ugh I love this image (because – yes it is brilliant! ), I ended up creating my own “visual” for transmedia marketing. 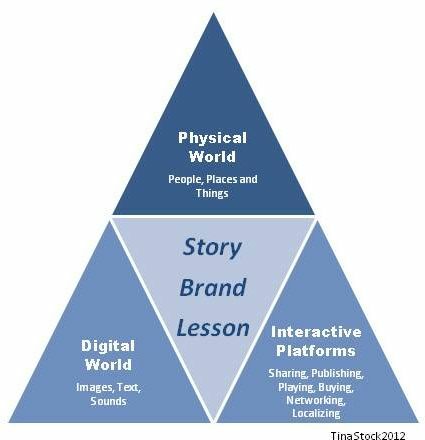 Not as cool as Gary’s, but it does simplify the world of transmedia by breaking it down to the basic elements of transmedia marketing: physical, digital and interactive elements surrounding the core story, brand or lesson. The physical world is the world of people, places and things. “People” represents the real people who act as a character, sing a song, tell a story and (in the world of business) talk to customers. “Places” are either story elements (a small cafe in Casablanca) or the physical location where story elements are displayed (theaters) or experienced (stores). “Things” are possibly the dimension that is in the middle of most change and requires the most thought. In the old world, “things” were the only means of conveying a story outside of a person (a book, a painting, a perfume) but in the new world many “things” have become digital (pictures) and even more things may become digital in the future (augmented reality). However, as more things become digital, there will be a higher premium on physical things, and in some instances the “physical” may convey the ‘wow’ factor better than the digital (the smell of coffee may NEVER be replaced by a digital simulation). I reduce the Digital World into the elements of images, text and sound. As I explore this world, I also look for the underlying components of ‘tools for creating the world’ and the ‘tools for receiving the world’. I combine social and gaming under the bucket of “interactive” platforms. This component of the world will continue evolving and growing for the next couple of decades. Ultimately, the interactive platforms enable the physical world to interact with the digital world. Nanotechnology may change this up in the future. Marketers who live in the digital world are comfortable with “pushing” (display advertising) and “pulling” (search, inbound marketing). Pushing requires the marketer to label people and push appropriate digital elements. Pulling requires the marketer to label the business and place digital elements where people can find them. Transmedia is scarier, and funner.